Tone up and slim down with these six easy moves. All you need is an exercise ball and 20 minutes of your time. When it comes to fitness equipment, there’s little that works your whole body better than the exercise ball. 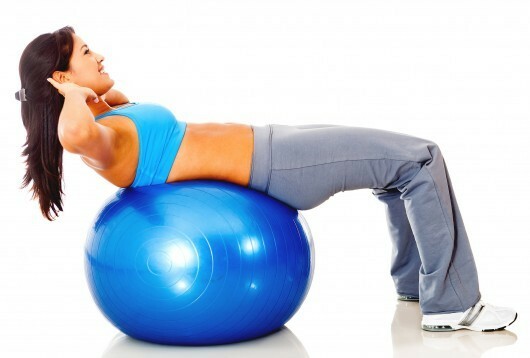 Staying on the ball engages all your muscles, which builds core strength and improves stability. Do this exercise ball workout three times a week. Sit on a workout bench with your hands placed on the edge, fingers pointing forward. Rest your calves and ankles on top of an exercise ball. Straighten your arms to lift your hips off the bench. Bend your arms to lower your body, then straighten them to the starting position. Lie on the floor with arms beside you and calves on the ball. Lift your backside up without arching your back. Keep your abs tight. With hips still raised, bend your knees and roll the ball toward you with your feet until they’re flat on top of the ball. Assume the top of a push-up position but rest your forearms on the exercise ball. Keep your abs strong and your neck in line with your spine. Lie on the exercise ball with your middle back resting on top, arms straight, and palms on your upper thighs. Curl your upper body forward, one vertebra at a time, keeping your hands on your thighs. Lower to the starting position. Hold the ball out in front of you with your feet hip-distance apart. With arms straight, bring the ball down to your thighs. Bend your elbows and curl the ball up to eye level. Press the ball up at a 45-degree angle until your arms are fully extended. Hold the ball above your head with your arms straight and feet hip-distance apart. Keep your back flat and abs tight as you bend your knees and twist your torso to lower the ball toward your left foot. Return to the center with the ball overhead, then twist to the right side.